The Tivoli Avenida Liberdade Lisboa, the Grande Dame of hotels in Lisbon, is a true landmark, delivering exceptional hospitality since 1933. Today, as ever, it is the place to see and be seen, a natural meeting point for celebrities, heads of state, actors, and royalty alike. The hotel’s location in central Lisbon and the theater district explains its popularity with theater and film stars. It is a hotel with its own particular charisma, an icon in the Portuguese capital. For over 80 years, the high standards of quality and level of service have made the Tivoli Avenida Liberdade Lisboa a landmark among Lisbon hotels. 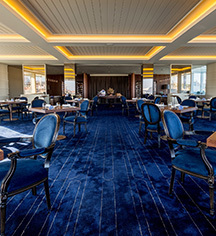 With its cosmopolitan lobby and stunning Sky Bar, it is a natural choice of top executives for meetings and banqueting in the hotel, or within its own purpose-built Conference and Events Centre. The hotel’s aura is connected with several decades from the 1930s to the 1960s. However, it has always been a permanently updated classic - it is not a brand that hearkens permanently to its past. It innovates in hotel concepts and in service and sets the tone as the place to be. 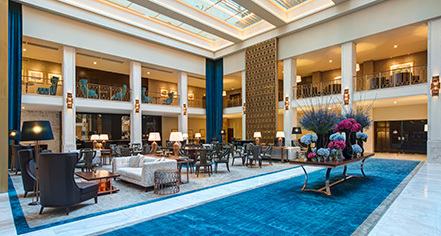 Discover Lisbon's best kept secrets with the Experience Teams, shop ‘til you drop in Avenida da Liberdade and Chiado's luxury stores, or simply unwind by the oasis of the hotel's unique swimming pool, amidst the fronds of its semi-tropical garden. Discover the wealth and variety of rooms and views, from Deluxe Rooms to the stunning Presidential Suite, which make each stay an unforgettable experience. Wining and dining are paramount, in the best European tradition; join in the stately and exclusive Terraço rooftop restaurant for gourmet offerings, to discover the best in contemporary Portuguese cuisine. For unique, seamless meetings and conferences, step across the courtyard to the palatial 19th century Conference and Events Centre. The Tivoli Avenida Liberdade Lisboa has an extensive collection of art, the vast majority of which can be seen in the elegant corridors and public areas of the hotel. With over 205 pieces, including paintings, prints, furniture, and sculpture, the hotel has the largest collection of work by the Belgian artist Mily Possoz. It also offers a journey back in time with its tribute to the actor Beatriz Costa, where guests can see images of the hotel and a historic Lisbon, as well as messages dating back to the time she lived in the hotel. The vast collection includes works by highly acclaimed artists, including tapestries by Vieira da Silva and Concessa Colaço, paintings by João Hogan, and ceramics by Jorge Barradas. The preponderance of Portuguese artists formed the heart of the Tivoli Avenida Liberdade Lisboa art collection. For a real tourist experience, jump on Tram 28 to weave your way through this city's amazing history and friendly traditional neighborhoods. Or maybe take a short ride to Belém to explore the simply amazing Jerónimos Monastery, the brand new Coach Museum, or the new Museum of Art, Architecture, and Technology (MAAT), a much talked-about riverside sensation. End the day with some retail therapy among the luxury brands on Avenida da Liberdade. Tivoli Avenida Liberdade Lisboa, a member of Historic Hotels Worldwide since 2017, dates back to 1933. Beatriz Costa was the biggest star of musical theatre in Portugal and Brazil. She lived the last 30 years of her life in room number 600 and is the “soul” of the hotel. Parking: Self-parking: Available; surcharge. Valet parking: Available; complimentary. Shuttle Service: Shuttle service to and from the cruise terminal may be scheduled through the resort's concierge. Rates apply. The Tivoli Avenida Liberdade Lisboa, the Grande Dame of hotels in Lisbon, is a true landmark, delivering exceptional hospitality since 1933. Today, as ever, it is the place to see and be seen, a natural meeting point for celebrities, heads of state, actors, and royalty alike. Learn more about the History of Tivoli Avenida Liberdade Lisboa .